Plant dyed silk ribbon for wedding bouquets, invitations, photography styling, gift wrapping. Orders shipped within 1 business day! 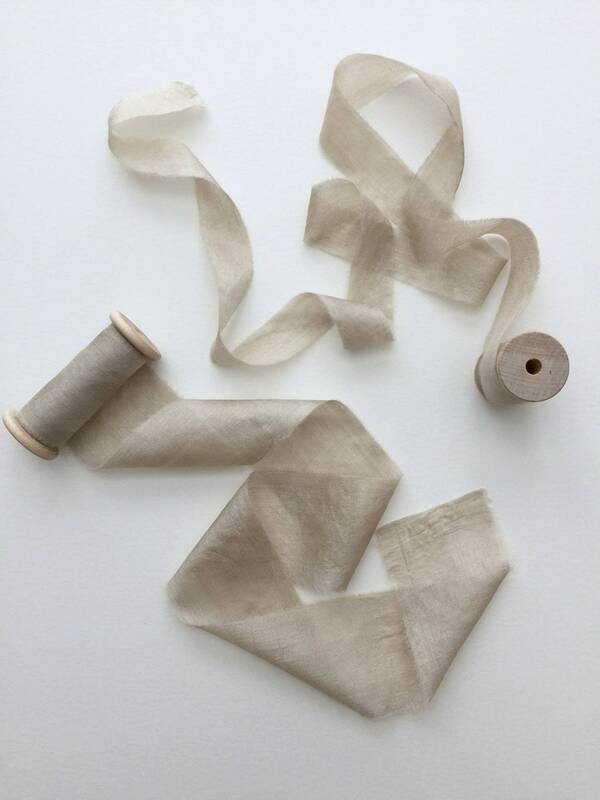 Taupe natural dyed silk ribbon. Hand dyed in my studio using plant dyes. 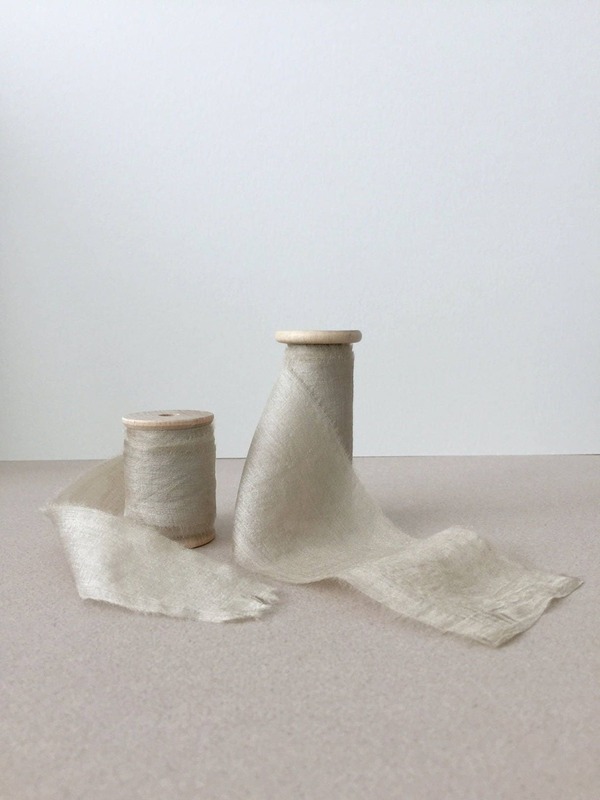 100% hand-loomed silk ribbon is airy and has a beautiful sheen. NOTE: Handmade wooden spool will be dark brown or light, depending on availability. Choose ribbon width and length from drop down menu. Eco friendly! Perfect for bridal bouquet, invitations, gift wrap, or styling! Every step is slow crafted by hand in my studio. 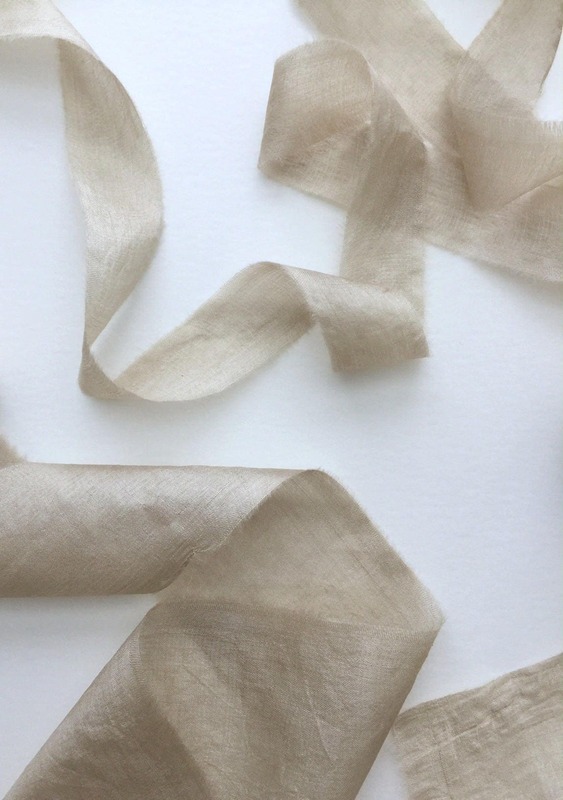 From hand dyeing silk using natural dyes from flowers, roots, foliage, nuts, fruits, and woods, to tearing it organically into ribbons embracing imperfection, and lightly pressing for a natural texture. You are buying a "living color" that may appear to change depending on the lighting. The ribbon may have marbling and speckles from the natural dyeing process. Habotai silk ribbon with raw edges. Silk ribbon is hand torn for an organic look, if a thread is loose along the length of the ribbon, it can easily be cut. Measurements are approximate. I ship orders within 1 business day from Monday through Friday. On holidays, I will ship the following business day. Select your preferred shipping service (STANDARD, PRIORITY, or EXPRESS) on the Shipping drop down menu at checkout. Hand wash with pH neutral soap, natural dyed colors are effected by a change in pH. Air dry. Iron on medium-high setting. Dry floral stems before wrapping with silk ribbon, plant food will react to the silk color. Follow me on Instagram @thepoetryofsilk for inspirations and new color updates. We would love to see how you use our plant dyed silk ribbons! Tag us to see your images for a chance to be featured. I gladly accept returns only on unused items when you contact me within 3 days of delivery. 1. If you contact me within 3 days of delivery and your return is approved, I will provide you the return address. 2. Ship items back to me in unused condition within 7 days of delivery, using the original packaging. Your postage expense for returning items is not refunded. 3. After items arrive in unused and original condition, I will process a partial refund. Shipping cost from invoice is not refunded. I ship orders within 1 business day, from Monday to Friday. When there is a holiday and the post office is closed, I will ship the following business day. STANDARD (5 to 7 business days within USA). PRIORITY (2 to 3 business days within USA). EXPRESS (1 to 2 business days within USA). How many silk ribbon spools will I need for my bouquet? These are my recommendations, but feel free to select your own. 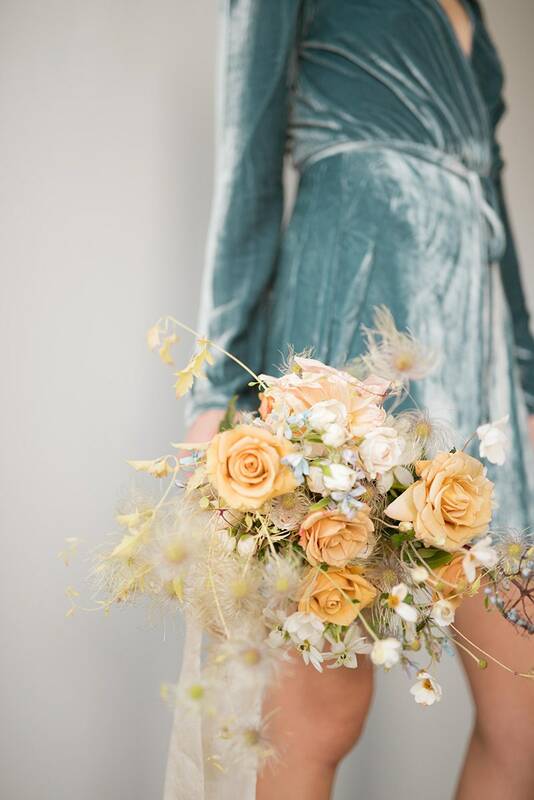 You can always mix and match silk ribbon colors for a one-of-a-kind look. Brides can use each silk ribbon to its full length, or either cut or loop to create folds for a medium or short length ribbon. 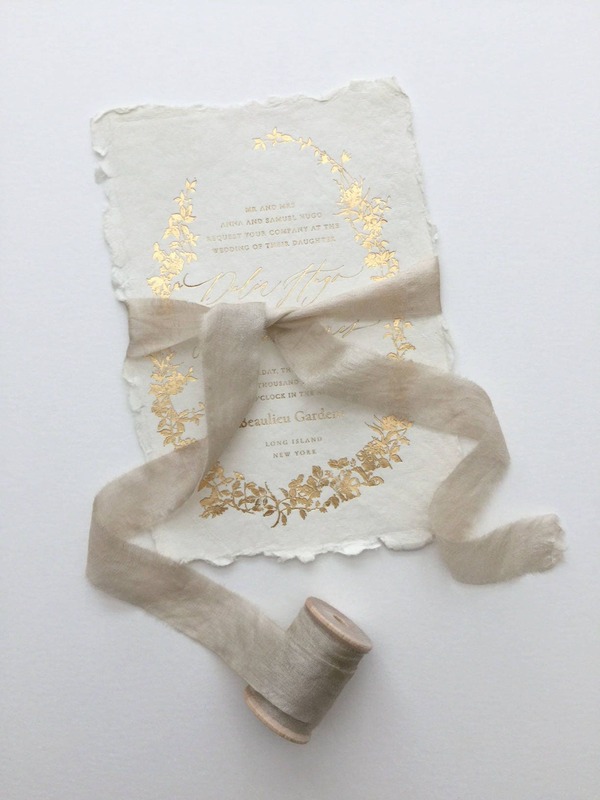 How many yards of silk ribbon do I need per invitation? Most calligraphers and wedding invitation designers use 1 yard to adorn each invitation. My plant dyed colors may vary from batch to batch, for this reason I do not offer samples. 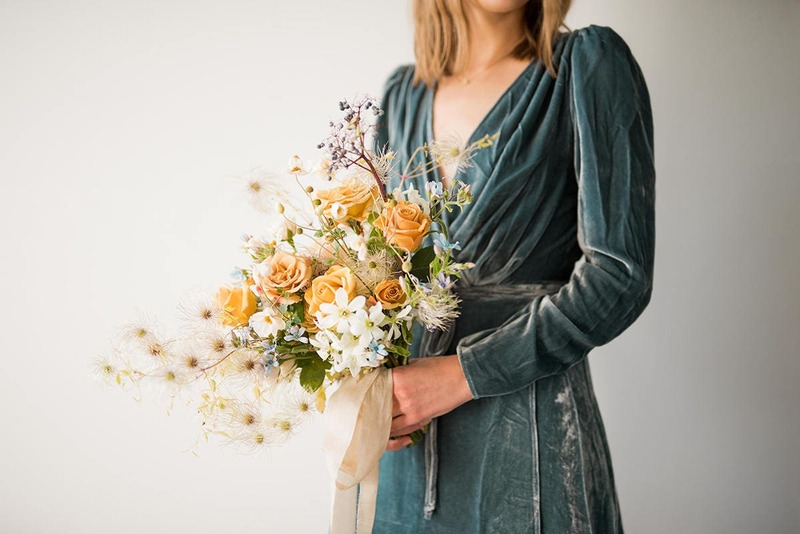 Even if the color doesn't match precisely, they always look beautiful and add another layer of thoughtfulness to wedding invitations, programs, and bridal bouquets. Do you offer custom colors? At the moment, I am not offering custom colors. I hand dye limited edition colors. Do you offer wholesale discount? How are your silk ribbons made? Following a wabi sabi lifestyle, every step is slowly crafted by hand in my studio: from hand dyeing silk using plant dyes from flowers, roots, foliage, nuts, fruits, and woods; sourced from fair trade companies or locally foraged, to tearing it organically into ribbons embracing imperfection, lightly pressing for a natural texture, and rolling onto handmade wooden spools. You are buying a "living color" that may appear to change depending on the lighting. Each silk ribbon is one of a kind and may have nuances, marbling, speckles. 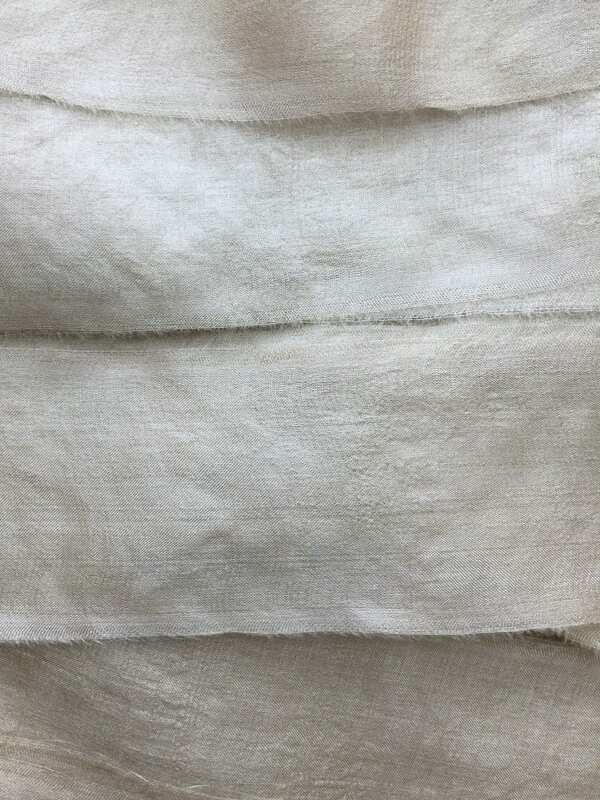 Plant dyeing embraces imperfection and find beauty in its authenticity. My plant dyed colors may vary from batch to batch. The silk ribbon came beautifully packaged and of course the ribbon itself was a dream. So soft and delicate. They look lovely on my light gray/gold wedding invitations sealed with a gold wax. Color pictured was true. Thank you!! Absolutely the best packaging of any purchase I have made from Etsy - beautiful paper insert with embossed shop name, small linen bag holding the spool of silk, shop name stamped on inside of box. Really nice presentation. And the silk ribbon is beautiful.